Alt Egyptian names: る㏌ㅱ㏏㏏, る㈖㏲㏏㏏㆗ 'to bring up, nurse', rnwtt, rnnt? Meaning: 'She who belongs to the name' name /rn/ belongs to /nt/ she /t/, She who rejoices /rnnwt/, She who brings up, bring up/foster/nursed by /rnn/ beget /wtt/, She who brings up, bring up/foster/nursed by /rnn/ snake : /wtt/? /wat/? 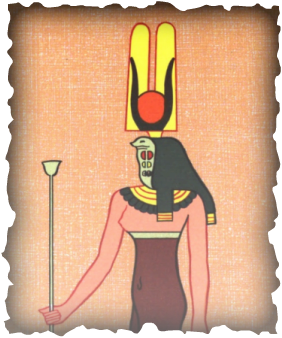 A women with a cobra's head or a full bodied Cobra with a feather, feathers atop her head and sometimes a solar disk crown. Sometimes in the form of a lion. An ancient goddess. She is the goddess of nourishment, the harvest, nursing and rearing children, protection of the Pharaoh in the Duat, and the 9th month. Powerful in the Duat/ underworld can destroy enemies with her gaze or fiery breath. She received offerings from wine makers and often there would be a shrine near a wine press. She was thought to give a chid their name /rn/ran. She became the goddess of fortune becuase of her connection to the /rn/ name and if it was destroyed as well as the physical body or Ka statue then they would be destroyed. To know one's name meant you had power over them, especially if you knew someone's true name. Such as the Story of Auset/isis and her tricking Rā into giving her his real name in order to heal him. I will make the Nile swell for you,without there being a year of lack and exhaustion in the whole land,so the plants will flourish, bending under their fruit.The land of Egypt is beginning to stir again,the shores are shining wonderfully,and wealth and well-being dwell with them,as it had been before.